The Southern Magnolia (magnolia grandiflora), also known as 'Bullbay' is an evergreen, moderately large tree, attaining up to 100 feet in height with a straight 2 to 3 foot diameter trunk. It has an attractive symmetrical growing habits which makes it a desirable and ornamental landscape specimen. 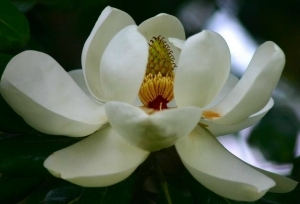 Southern Magnolia is a well known and widely grown tree, native to the southeastern U.S. from North Carolina south to Florida and west through Lousiana, Mississippi, Arkansas and parts of eastern Texas. It is hardy to zone 6 and will succeed in full sun, but is also very shade tolerant and can be found growing in rich well drained bottomlands along with other hardwood species that require moist soil conditions. There are no known destructive insect or disease pests. The distinct leathery bright green foliage is glossy on the surface and has reddish brown wooly hair on the underside. Individual leaves are up to 8 inches long and 3 inches wide. The tree produces a continuous display of huge showy flowers the size of dinner plates which are also edible. The gorgeous blossoms are creamy white, consisting of six to twelve upturned petals with yellow and purple stamens which are deliciously fragrant. Blooming begins in spring and continues into summer, followed by conspicuous reddish orange fruit pods up to 4 inches long. The seeds themselves are about 1/2 inch long and ripen in the fall. Being evergreen in habit, the Southern Magnolia tree makes a superior ornamental landscape addition which is magnificent even when not in bloom.